Spina bifida is a birth defect which takes place when the spine and spinal cord don’t form correctly. It comes under the wide category of neural tube defects. The neural tube is the embryonic construction that ultimately develops into the baby’s brain, spinal cord, and tissues that surround them. Usually, the neural tube forms early in pregnancy, and it closes by the 28th day after formation. In babies with spina bifida, a part of the neural tube fails to grow or close properly, causes the faults in the spinal cord and in the bones of the spine. In a form of spina bifida called meningocele, the protective tissues around the spinal cord drive out through the opening in the vertebrae, creating a sac filled with liquid. But this sac doesn’t contain spinal cord, so nerve injury is less likely to happen, however, later complications are possible. The mildest form, spina bifida occulta results in a minor separation or gap in one or more of the bones of the spine. Several people who have it don’t even know it, except the condition is discovered during an imaging test done for unrelated reasons. It is also known as open spina bifida, it is the most severe form. 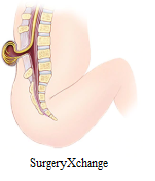 The spinal canal is open along with numerous vertebrae in lower or middle back. The tissues and spinal nerves push through this opening at birth, forming a sac on the baby’s back, typically exposing tissues and nerves. This makes the baby prone to life-threatening infections. Spina bifida occulta.Since the spinal nerves generally are not involved, typically there are no signs or symptoms. However, evident signs may sometimes be seen on the newborn’s skin above the spinal defect, including an abnormal tuft of hair, or a small dimple or birthmark. The membranes near the spinal cord push out through an opening in the vertebrae, creating a sac filled with fluid, but this sac does not include the spinal cord. Family history of neural tube defects. Couples who have had one child with a neural tube defect have higher chances of having another baby with the same defect. The risk increases if two previous children are having the same condition. Some medications. For example, anti-seizure medications, such as valproic acid (Depakene), seem to cause neural tube defects when taken during pregnancy, possibly because they interfere with the body’s ability to use folate and folic acid. Women having diabetes with no control over their blood sugar level have a higher risk of having a baby with spina bifida. Pre-pregnancy obesity can increase the risk of neural tube birth defects, including spina bifida. It is important to have a good amount of folic acid in your system during the early weeks of pregnancy to prevent spina bifida. Most women don’t discover that they’re pregnant until this time, experts say that all women of childbearing age should take a daily supplement of 400 micrograms (mcg) of folic acid. Various foods, including enriched bread, pasta, rice, and some breakfast cereals, are fortified with 400 mcg of folic acid per serving. If you are trying to conceive, most pregnancy experts believe supplementation of at least 400 mcg of folic acid a day is the best approach for women planning a pregnancy. Your body does not absorb folate as easily as it absorbs synthetic folic acid, and most people do not get the recommended amount of folate through diet alone, so vitamin supplements are necessary to prevent spina bifida.